nom nom nom TASTE TEST this Friday 9/28 at the Cornwall School! Nutrition Outreach and Mentoring is looking for volunteers for our first Cornwall taste test of the year with local, in-season produce this Friday, September 28th at the Cornwall School. This month we will be serving SWISS CHARD! At Cornwall, there will be two shifts: one prep shift from 11am-12pm and one serving shift from 12-12:30pm. Please fill out this Google form by Thursday at 6pm if you would like to volunteer for either or both of these shifts! 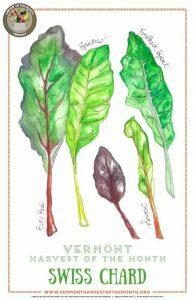 Before the taste test, feel free to also browse through the Vermont Harvest of the Month Curriculum to learn a little bit more about swiss chard. If you have any questions, please feel free to email us as nom@middlebury.edu. We can’t wait to volunteer with you! NOM x Relay for Life – SMOOTHIE MAKING! Taste Test this Friday 4/15 at Mary Hogan! nom nom nom Taste Test AND Workshop this Friday 4/12! nom nom nom Taste Test this Thursday 3/21 at Cornwall! nom nom nom Taste Test this Friday 3/15 at Mary Hogan!